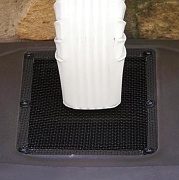 The Rain Mizer Rain Barrel provides up to 50 gallons of rainwater storage. This attractively designed rain "barrel" is molded to fit well under downspouts and up against the outside wall of the house or building. The design also allows for linking multiple Rain Mizer Rain Water Barrel's together. The linking kit (sold separately) allows users to build a water conservation system that has the ability to store 50, 100, 250 or more gallons of water. 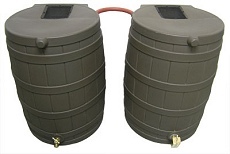 Simply add a barrel and a linking system and you'll have another 50 gallons of capacity! Each rain barrel is made of durable polyethylene construction and comes with UV protection which guards against fading and cracking. The Rain Mizer Rain Water Barrel's spigot design is of brass construction, with Teflon tape wrap around the threading. The brass gives great impact and corrosion resistance while the Teflon ensures a leak-proof connection to the barrel. This high quality brass spigot will typically last much longer then its plastic counterparts. The screened opening is fastened with screws. This allows the barrel to be securely enclosed, yet still provides an ample speed of water flow into the barrel. Top central concavity also feeds rainwater to the screen to minimize the possibility of pooling or standing water. Additionally, there is an overflow opening on the front that allows the excess water to be moved 23 inches away from the wall of the building. Flat back allows the Rain Mizer to fit easily against walls. The Rain Mizer Rain Water Barrel Stand (shown right) is great for raising the barrel off the ground which helps create water more pressure (for hoses, etc), allows room for buckets, and it makes the whole unit look more attractive. The design is sturdy and rugged and made to function with your flat-back Rain Mizer Rain Water Barrel. Just click on the Add to Cart button and then make your optional stand choice. Colors shown are approximations. Colored barrels are shown with Optional Matching Stand. Far right picture shows Optional Black Stained Ribbing available on all colors except black. Just click on the Add to Cart button. Then add a stand or black stained ribbing if you wish. Remember to drain and clean your Rain Mizer Rain Water Barrel on a regular basis and before the winter season. Keep gutters and downspouts clear of debris to prevent pests and mosquitoes from getting into your Rain Mizer Rain Water Barrel. Check connections often and clear grate filter (screen) when needed. Linking Kits are for use with Rain Mizer Rain Water Barrel systems only. These kits are not intended for use with any other rain barrel systems. Linking kits are not returnable. The rain water you collect in your barrel is not intended for human consumption.